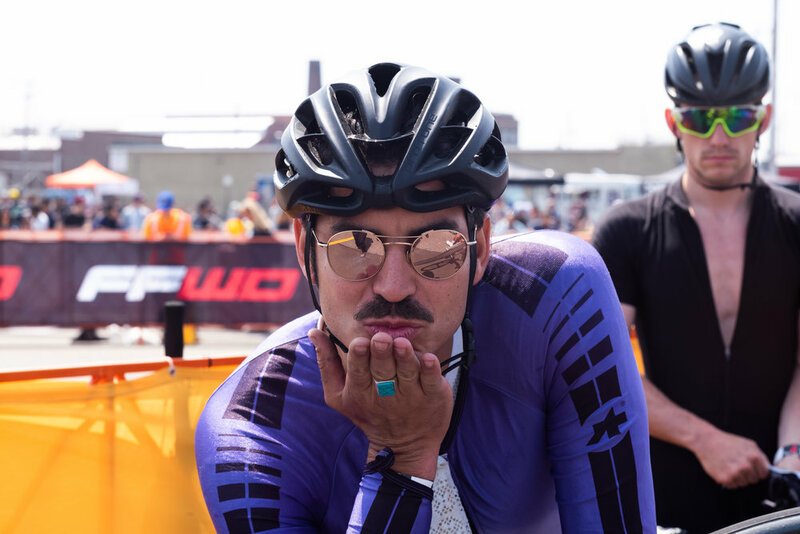 Adrian Flores, the first cyclist to wear ruffles to victory, was a household name before he crossed the finish line in purple and white. With continued success, Flores (and his fully customized Scott Addict bicycle ) became synonymous with showing up daily as your fullest self. Harnessing the ability to channel what he desires in life, Adrian lives each day submerged in the outlets he enjoys the most - creative expressions, adventure, and the inner peace of fulfillment. LifeCycle Biking had an opportunity to connect with Adrian and learn more about his biking lifecycle. Thanks for taking the time to chat with us, Adrian! Let's get right to it- What brought you to the sport of cycling? My cycling life has had a few different chapters. I rode a BMX bike around when I was young around the neighborhood. I re-discovered the bike during the summers in college when I was a collegiate swimmer and that’s where it really took hold of me and brought me to where I am today. Cycling provided me a sense of adventure and exploration I simply couldn’t do staring at lanes in the pool. You’re from Austin, TX and moved to Barcelona for some time. How have your home and travels influenced the way you ride? Austin is where I found my legs and spent my formative years on the bicycle. I grew up in the competition and hill-country rides of that area of Texas, where brutal heat and open rolling hills slowly eat away at you over long rides. Whenever I come across a place like that in another part of the world it reminds me of home, it kind of makes me feel alive. I’m stronger in that sort of terrain and climate. Barcelona is not too dissimilar, but it was the first place I lived with climbs that lasted longer than 10-15 minutes. Moving to BCN was intended to be a growing experience and it definitely helped me learn to appreciate cycling on a deeper level than competition. I learned to ride just because I loved riding. Speaking of the love of riding, what has been your favorite moment on the bike so far? I’ve had so many life-changing moments on the bicycle but at the moment the one that sticks out to me is a 7-day long ride from Portland to San Francisco with 3 friends of mine. The fourth day of the journey I had suffered some sort of knee injury and my only option was to tough it out 129 miles of insane hills or rent a car the rest of the trip. I toughed it out and it was one of the most beautiful rides I could have hoped to do. We admire your willingness to push your limitations. Tell us about your brand, Prince Cycling. Where did the inspiration come from? 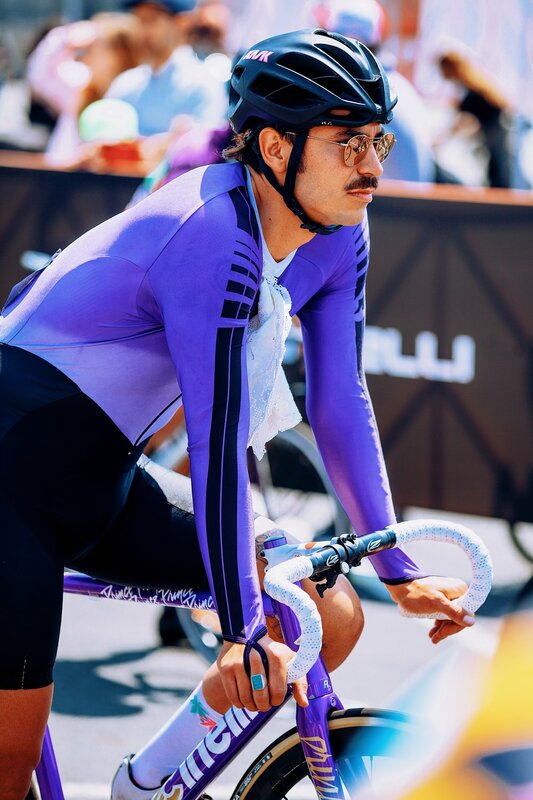 How has His Purple Highness contributed to your cycling life? I got a few nicknames over the years and I think Prince stuck after I dyed a cycling skin suit purple and sewed ruffles into it. For me, it represents a sort of confidence in yourself, your abilities that I like to pull from the Prince Persona. I still can’t really fathom the reach this character of mine has had. I still have people walk up to me to either tell me that I look like prince or ask if I am prince cycling. Creativity is very present in various areas in your life. How did you discover your love of creative writing and cooking? Are these interests/passions intertwined with cycling at all? Writing was my first outlet as a young kid to express myself and it never faded. Somewhere through college I decided I should pursue that deeper and I graduated with a degree in English, creative writing. As for cooking, I’ve always been around it but it wasn’t until I was much older that the nature of my cooking has gotten more precise. As an athlete, it’s important to put good fuel (food) in your engine. As I’ve eased from such a strict training regimen food has become less a utility and more a passion. I feel that in all my pursuits I find a tranquil space of creativity and peace. They’re all connected in that way. As a cyclist of color in a field dominated by the majority, how would you describe your ability to ascend into pro racing and establish a presence for yourself (and subsequently other riders of color)? I’ve had a very fortunate child-hood. My father is Honduran and my mom is Irish and I learned from both of them all I needed as a child to make me a natural athlete. Driven role-models and plenty of athletic outlets shepherded me through the cycling ranks quickly. The key here is that they enlisted me in every type of sport that helped me build all sorts of coordination. So now when I jump into something new it’s typically just mastery that’s required. I usually catch onto basic skills and aspects of a sport really easily. Is there anything you would change in the landscape of today’s cycling scene? I personally find more joy in a lack of social pressure and a more inclusive environment. Cycling, much like society, tends to segment itself off to those who participate in the sport in different capacities. I enjoy bike races that take time to include recreational cyclists. Patrick Newell and Benedict - have not so quietly influenced personality and style onto cycling in a way thats had a big impression on not only my own life, but hundreds of thousands of cyclists the world over. Together and separate they are a force to be reckoned with. Tyler Hamilton - is known for an epic saga which is his pro-tour life but his after pro-tour life is much more fascinating and inspiring. He’s a kind and gentle human with a passion for retribution of the self and others. He continues to hold a warm spot in my heart. Anna Schwinn - is one of those unabashedly opinionated and objective cyclists that I look upon for the real. She’s got a ton of life experience and a ton of personality. Any time I get to see her at a cycling event or tradeshow is a blessing and I hope she continues to be 100% authentically herself forever. Kym Perfetto - She really is nonstop. And she’s great. Fun to watch, fun to be around and an inspiration if I ever feel like I’m overwhelmed. I just remember, Kym is doing more. In my life cycle, cycling has been . . .
A space for friends, an escape, a sanctuary, a place to reset, to thrive, to explore. Cycling has been my rock. 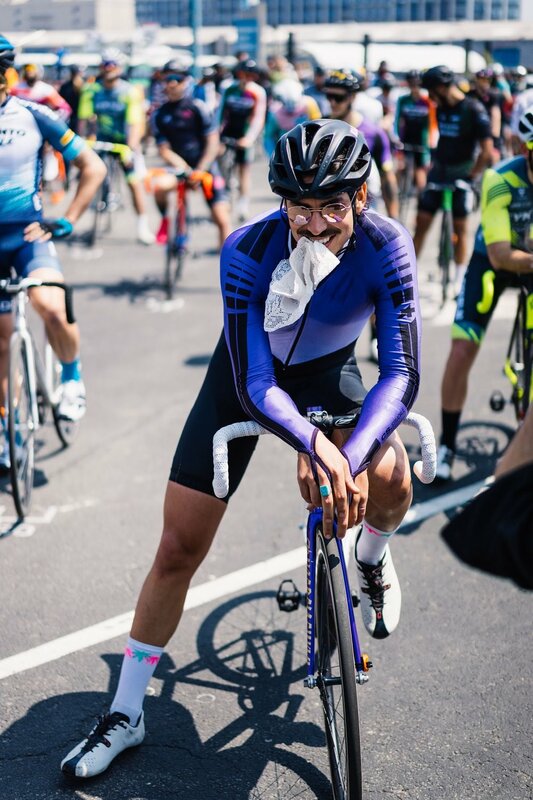 Check out Adrian and his custom purple chariots at Prince Cycling.